Two typical Promontory moccasins recovered in may 2013, with the bottom row showing their patched soles. I feel like there’s another possibility that isn’t being considered in the theory presented in the article. Maybe there are more children’s moccasins present simply because children outgrow their footwear more than adults do. My own son typically goes through a few pairs a year because he’s outgrowing them, my own last until they wear out. True, but I feel that such materials would likely have been handed down to the next kid. Seems like in a world where producing objects is time consuming and resource consuming, they would reuse everything until it was worn to the point of being unusable. I too believe their may be another explanation, having spent time with indigenous populations in South America and Africa it is possible that adults were NOT wearing moccasins as much or at all! When I used to run marathons and triathlons I could run on asphalt roads without shoes during training runs because my feet were so leather like! Back then adults probably weren’t very big….small hands and feet. Who’s to say? I think trying to divine any information whatsoever on the population makeup of this culture by analyzing these shoes is pretty foolish. That cache of moccassins could have occured for a large number of reasons and says nothing about the makeup of the population. This is some pretty big over reach in my opinion. 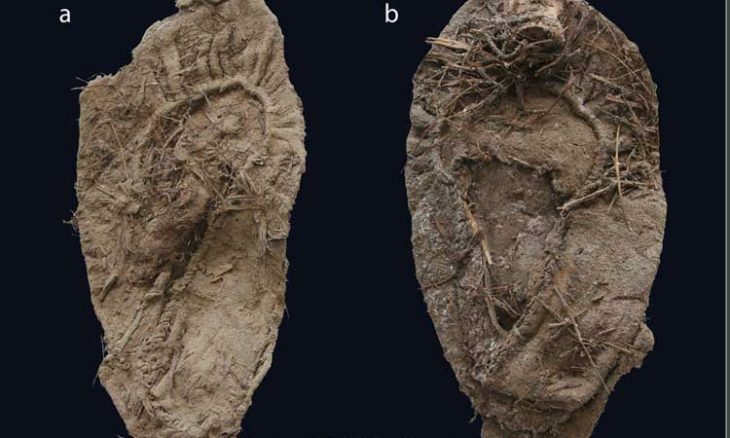 Maybe the “little” moccasins were indeed ceremonial and were left behind to signify that childhood was left behind in a sacred initiation to become adult. Very similar in concept to the multitude of “little hands” adorning a cave in Australia. where do I view the moccasins at? I can answer a few of your questions….Blake did a wonderful job with this story, but the original American Journal of Physical Anthropology article did cover some of these topics. Although there are very many moccasins, this is not a cache of moccasins–a cache would imply that these were items that might have a future use. A very high proportion of the moccasins, (~72%) had whole or half sole repairs already, and all of them have heavy signs of wear. They were being discarded because they were worn out. This was actually common at camps, historically, but very few archaeological sites have this kind of preservation. We are often asked about growing children, but in that connection, it is important to remember that moccasins are not like modern footwear for durability. In the soft, snow conditions of the Subarctic winter, an adult would go through about four pairs of moccasins in a winter, but might actually go through a few pairs in one day if involved in heavy tracking or wet snow conditions. The rough terrain around the caves would mean that moccasins wore out quickly, more quickly than a child could outgrow a pair. If you read historical accounts for the Subarctic, Plains and Southwest, footwear (rather than barefeet) was absolutely essential, and there a number of accounts of the lengths Apacheand other people would go to ensure that they had moccasins above all else that might be needed. The turned up toe of the Apache moccasin was sometimes called a “cactus kicker,” for example, a real hazard in many places. There are also historical studies that show the biggest and healthiest people in the entire 19th century world were Plains equestrian people such as the Cheyenne and Arapaho. Living in villages, towns, or cities has a number of real health and social drawbacks. So from this and studies of prehistoric burial populations, we know that not everyone in the past was smaller, and quite the contrary. There may have been ceremonial activities in the caves, and there is rock art in one of them. Historically, young Apache children had a first moccasin ceremony at about two years of age. On the whole, however, there are really abundant traces of activities from all phases of daily life…hunting, hearths for cooking and warmth, hide preparation, making and replacing stone tools, fixing arrows, making bows–these sorts of things were by far the most common activities. If you want to see some of the moccasins first hand, there are several on display at the beautiful new Natural History Museum of Utah, on the University of Utah campus in Salt Lake City. Thanks so much for fielding these questions! It’s really great for members of our community to have researchers like you improve our understanding of the work you do. I think that the little moccasins were ceremonial as well and they were left behind meaning that they didnt have a childhood which was difficult to kinda grow up in a way. I am the author of a dozen non-fiction books on the history and culture of the Chiricahua Apaches and live among the descendants of the Promontory cave dwellers. I am currently researching the ancestral Apache population in the Yukon and Northwest Territories in an attempt to track back the people into antiquity. Every aspect of my research into the history and culture of the Chiricahua Apaches agrees with Jack Ives, e.g., that the moccasins were discarded because they were worn out, an activity that continues to occur today, albeit under different circumstances. The turned-up moccasin toe is distinctive and currently separates the Chiricahua Apaches from the other Apachean bands. Given the scope of the cave findings, it is easy to imagine that Utah cave dwellers were members of one of the groups that left the sub-arctic and migrated southward. If true, these migrants are the ancestors of the nearly 5000 Mescalero and Chiricahua Apaches living on the Mescalero Apache Reservation in New Mexico. I’m guessing you have no idea where this cave is actually located. It is on a piece of land the juts out into the Great Salt Lake…which is the servings saltiest body of water on the face of the earth. I’m also guessing you’ve never walked across the Salt Flats. The dried out part of the crust is only a couple inches above the water table. If you don’t have enough fresh water to thoroughly wash the salt off your feet, your feet burn for several days! I’m guessing again that you’ve never created apparel. It’s impossible to come up with a design that hasn’t never been done before…especially when trying to utilize what little material you have at your disposal. One more guess is that you’ve never worked with leather…from beginning with a fresh hide. I have. The more a piece of leather is worked, the thinner it stretches when it’s wet. 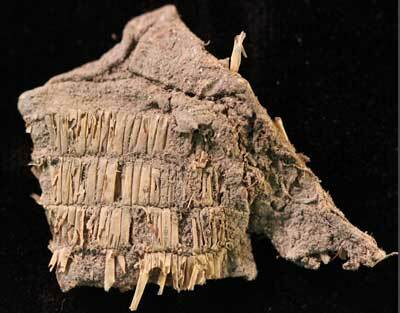 Since leather is absorbent, in that particular area, they would have been saturated with extremely salty water. When leather dries, it can shrink down to a lot less than its original size. Leather also takes whatever shape it wants to when it dries, depending on how much fat is still on it and the tools used. One last thing…how can you live among the Promontory descendants when it’s JUST a guess who they are and only nicknamed this due to the location of the cave? Has any one done a correlation between this new culture discovered in the Promontory caves and others in the area and the disappearance of the Coso people of California’s Mojave Desert. Hogup and Danger Caves have produced some unusual artifacts including moccasins of the type being found in the Promontory caves, several of the etched gaming reeds. Is there anything else that has been published detailing what has been found and anything that has determined where this new culture migrated from? Better rethink the theory. Interesting article. 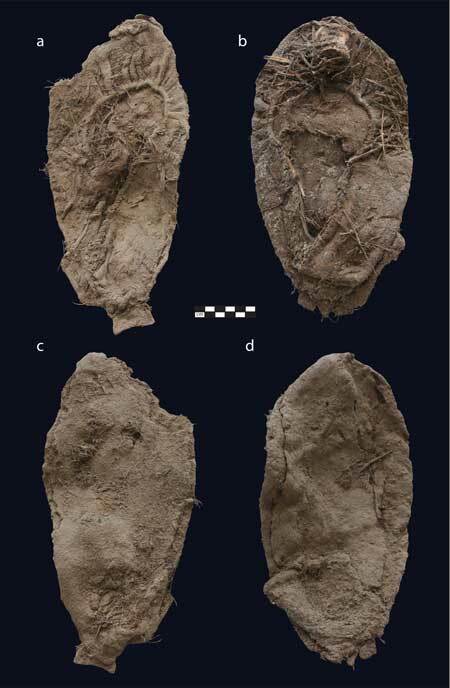 So….this archaeologist from Canada is excavating the caves at Promontory Point and has decided by the 207 cast-off moccasins they uncovered, that over 80% of those who occupied the caves were children under 12 using a calculated ratio. Hmmm….comparing this ratio to people I know starting with me…I’m 58, 5’6″ and wear a 6-6 1/2…depending on the width and toe shape (I have to accommodate my inherited long second toe. I have 3 sisters and 2nieces who are all shorter than I am…all but 1 who is under 5′ and whose feet are larger than mine. 1. They could be considered the height of 12 or less….I was tall when I was 12 then stopped growing. 2. 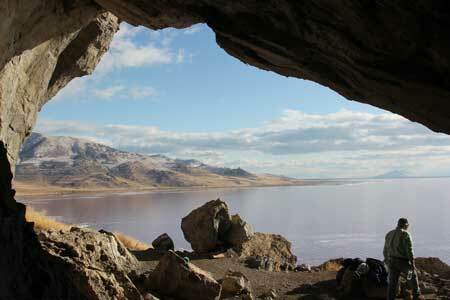 Leather Moccasins are absorbent….this area juts out into the Great Salt Lake…the second saltiest lake in the world. Leather is stretched, but shrinks up even smaller when it gets wet, then dries. Just ask O.J. or anyone who had ever worked with leather, beginning With the raw skin…like me. 3. The users of the cave could have been related to the native Indians of the Sonora region of Mexico who are famous more for their VERY small stature…I have friends whose recent ancestors came from there. They are less than 4′ tall and the 6 year old boy has larger feet than his mom. Most of our green card workers (38 of them) were shorter than 5’4″. 4. The water temperature is very refreshing …BUT…it’s very salty! Its fun to walk on and the salty crust on the top camouflages the water directly under it. ANYONE who has ventured into that cool water without rinsing their feet with fresh water can attest to the awful burning effect it has soon after (I’ve done that). Chances are, those who cast off those moccasins learned the hard way by wearing them in the lake and didn’t have a 10 other pairs sitting at home in the closet. Why don’t they think they were midgets? Nothing like taking something as simple as foot wear and make it, twist it and turn it into something just as complex as possible. Do you folks have something better to do with your time?